Ok, getting ready for Morphe has got me thinking about Christmas even earlier than usual. This weekend before I could make up the crayon costume I had to try out this idea I had for wee ornaments. I was thinking I’d send some along to Morphe and maybe sell some here on the site too. 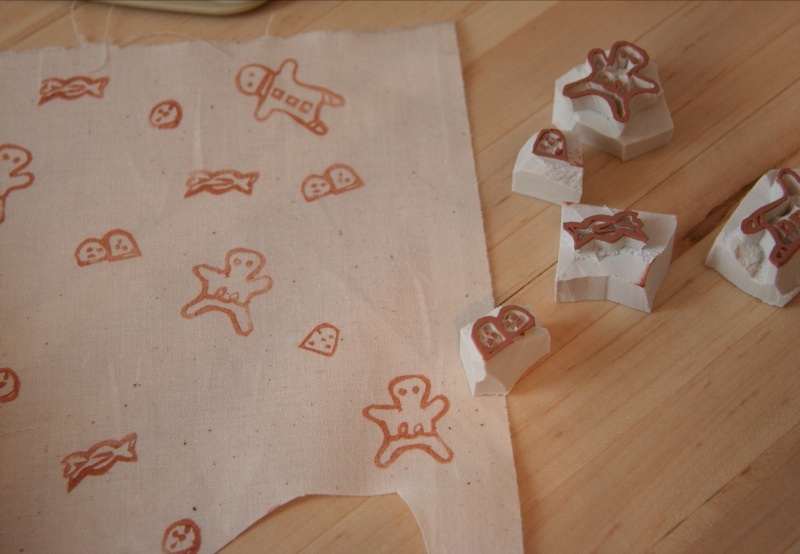 I stamped up some fabric with tasty holiday treats and then made little wee’s (about 3″ tall) out of it. They’re stuffed with polyfil and yummy cinnamon scent and topped with a jingle bell. I have 2 more holiday themes to cut out and a few more scents to hunt down and then the production line can begin. Great idea! I love the fabric. Love them love them! Put me down for some. I want a wee tree of them!! 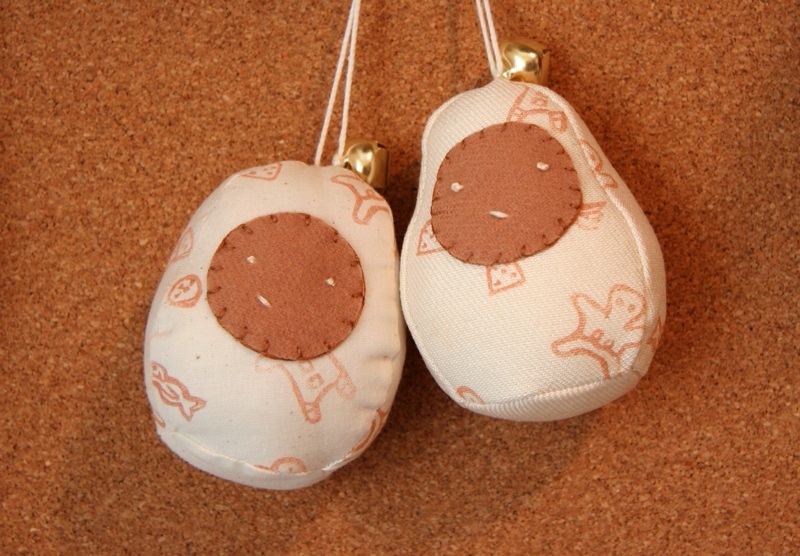 i love the wee ones (i will have a go at making some shortly, the instructions are really helpful thank you! )and i like the stamps – what sort of paint do you recommend for stamping on fabric? is it acrylic paint? we don’t have the same brand names here in switzerland, but maybe you could suggest what type of paint goes well with fabric? Oh the craftiness never stops here!! Ok Sepia ANNNDD Christmas Wees!!! hehehe Have fun and I will live vicariously through you!! These have to be the cutest thing. EVER . they’re amazing!! i’m especially fond of that little gingerbread man stamp with a scarf that looks like a growl. 🙂 what’s even better is they look like they know what’s under that tree wth their little sheepish grins. i love that they are peekers, too!! Very cute – such festive little wee’s! Your stamp carving is getting so great!! I’ve just gotta try it myself. The gingerbread boys are the best! Little cookies, candy in twisted wrapper. Just so cute! Great work! This has probably been asked before so if so I’m sorry in advance! How do you make the stamps? What do you use to carve them? They are so great, I want to try some of my designs! Thanks! they are so cute–sign me up, too! precious little wees…I made a few using your pattern (many thanks!) and I’ve got to try the christmas ornament version now, too. My grandmother would just eat those up (hopefully not literally since they do smell yummy..teehee) Thanks for the daily dose of inspiration. Love them! You definetely should put this wees up for sale or a swap. They are so pretty! I just love them and I love the instructions, too. You are incredibly talented and your blog, along with the other beautiful crafty ones, is a bright spot in my day whenever I see a new entry. I wrote about y’all recently (one day last week) on my blog and how I can’t keep up. The crafty in me wants to so very much, though. I think artsy people are very drawn to asethetically pleasing things and the gorgeous crafty blogs draw me in like no other. Please keep it up! I love the stamps you make. It’s inspired me to try it sometime soon. As if I have time to do ANYthing else aside from Mama-ing and knitting. How adorable! I love that you stamped the fabric just for this! Brilliant idea! What perfect ornaments! You have got to be one of the most talented people I know of. I love the printed fabric you made!… and the finished product is so wee and so cute. you’re such a genius it makes me wanna barf! Go Hillary! didn’t know if you were okay w/ people selling them, so i thought i’d let you know.